Summary: In 1954, there were lots of great new books for kids like Charlotte’s Web and Horton Hears a Who!. Good books for those who already knew how to read; for children just learning, there wasn’t much. Ted Geisel, a.k.a. Dr. Seuss, was hired to write a fun and interesting book for beginning readers, using an “official” list of approved words. He thought it would take him a week or two, but he ended up spending over a year getting it just right. 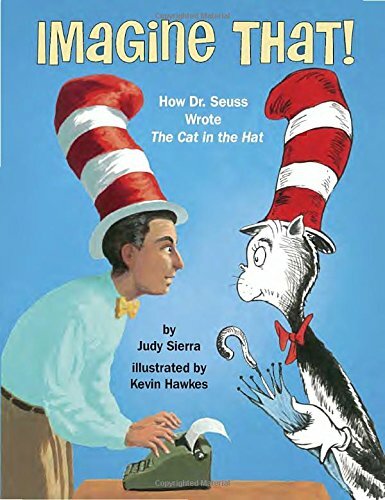 The result, of course, was The Cat in the Hat, and it became an instant hit, leading Ted to write more books for beginning readers like The Cat in the Hat Comes Back and Hop on Pop. When his friend Bennett Cerf challenged him to write a book with just 50 different words (The Cat in the Hat had 236), Geisel rose to the occasion once again with Green Eggs and Ham. Includes writing and illustrating tips from Dr. Seuss, notes from the author and illustrator, and a list of books by Dr. Seuss. 48 pages; grades K-3. Pros: A fun look at creative genius, with a few pages of Seuss-inspired rhyming text and plenty of Seuss-inspired illustrations. Messages about perseverance and hard work are subtly woven into the story. Cons: A brief biography or timeline at the end would have been a nice addition. The Dr. Seuss museum just opened up in Springfield, MA – apparently people are offended that it mentions that he was a racist (he bought into the anti-Japanese sentiment around WWII) but if you can accept that people are complicated, I’m sure this would be a great destination for Seuss fans!